Photography not only relies on the skill of the photographer but the quality of photography equipment used. As a beginner, one can easily start his/her photography dream using an entry-level DSLR camera or a mirrorless camera. However, there is nothing wrong with using the camera you have if you know its strengths and limits. 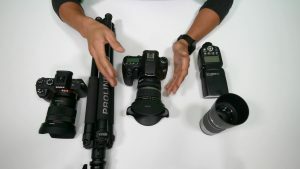 That said, here are some essential camera equipment every photographer should consider buying. Besides the camera, the lens is the most critical type of camera equipment for photography. In some ways, the lens might be more important than the camera itself. You can invest in a kit lens, prime lens, and telephoto zoom lens. Using different lenses has the effect of making your camera flexible for different types of photography. The flash is essential in any photography expedition. Most cameras have a built-in flash, but you can always buy an additional and stronger flash. They are mostly applicable when you need to mold and shape the light shining on your subject or when taking photos in dark environments. Tripod stands are important for many photographs, although their importance depends on the type of photography and the subjects you photograph. For instance, photographers specializing in nature photography often perceive a tripod as an extension of their camera. But people like street photographers or portrait photographers might not use the tripod often. The next item that should be on your list is a memory card. It serves to help you store photos and facilitate easy transfer to other gadgets. In most cases, the larger the memory card, the better especially if your camera takes excellent HD photos. Besides space, a good memory card should load fast to ensure your camera loads quickly. You do not have to be bogged down by the vast variety of camera equipment. Start with what is essential and learn what you like and what works for you!